COPD ("Chronic Obstructive Pulmonary Disease") has a diffuse disease pattern and is frequently referred to as obstructive bronchitis. The patients have hyperextension of the lungs as a result of closures in the alveoli or the bronchi, which initially makes CO2→O2 exchange difficult and impossible in later stages of the disease. Heavy smokers over many years make up 90 % of those affected. COPD mainly occurs after the age of 65 years. Studies undertaken in the USA have shown that high-flow nasal ventilation is basically suitable for breathing therapy of COPD patients. 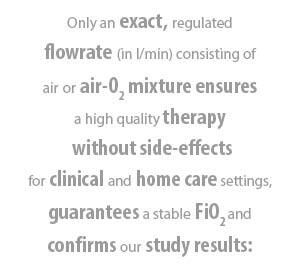 TNI® now provides a comfortable alternative to mask ventilation in the treatment of COPD1.